SATURDAY, AUGUST 16, 2008 @ 9:00 P.M. THIS WILL BE A GREAT SPECIAL TRIP. THE FULL MOON WILL BE OUT AND REFLECTING ON THE BEAUTIFUL SURFACE OF TABLE ROCK LAKE (BRANSON, MISSOURI). THIS IS A GREAT TRIP FOR FIRST-TIME, BEGINNERS AND ADVANCED PADDLERS. MAKE SATURDAY NIGHT A DATE! ALL PADDLERS MUST WEAR A LIFE JACKET AND ARE REQUIRED BY STATE LAW TO BRING ALONG A FLASHLIGHT OR WEAR A "HEADLAMP". IF ANYONE WANTS TO GO ON THIS OR ANY OTHER TRIP BUT YOU DON'T HAVE A KAYAK, PLEASE CONTACT EITHER RODNEY WRIGHT WITH 165 MARINA VIEW (336-2811) OR LARRY THOMPSON WITH BULL CREEK OUTPOST (561-1045) TO MAKE ARRANGEMENTS TO RENT A KAYAK TO BE DELIVERED TO THE LAUNCH LOCATION. 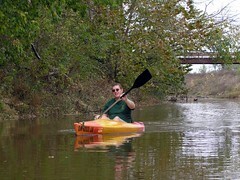 Club membership is NOT required and there is NO charge to participate in this paddle.... so, come on out and join us!!! Sounds like your love of the water matches my love of the snow. Ozark Mountain Rowing & Kayaking Club's Full Moon Paddle was a success! We had great weather and a beautiful full moon for the 61 paddlers who kayaked or canoed out to the island on Table Rock Lake. We then pulled up the boats on the beach on the island and made a campfire to roast marshmellows and make smores before paddling back to the "mainland". Thanks for the quick trip report. 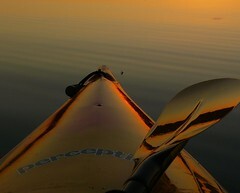 It sounds like you had a great night paddling trip! I'm sorry I missed it.